It's important to learn how to identify patchwork quilt blocks by the gridwork that makes up their layouts. Why? Because understanding the grids makes it easy to change the size of a quilt block and to recognize which quilt blocks work together best. We often name patchwork quilt blocks by the gridded arrangement of their patches and refer to them with terms such as four-patch, nine-patch, and five-patch. Those terms reveal how a block's grids are arranged. Imagine a patchwork quilt block made up of a grid of squares — just like a piece of graph paper. Each grid can be subdivided to create more grids, but the basic framework of the initial grid doesn't change. Patchwork quilt blocks are designed with grids, too, and with a little practice, you'll be able to recognize their structure immediately. What Are Four Patch Quilt Blocks? 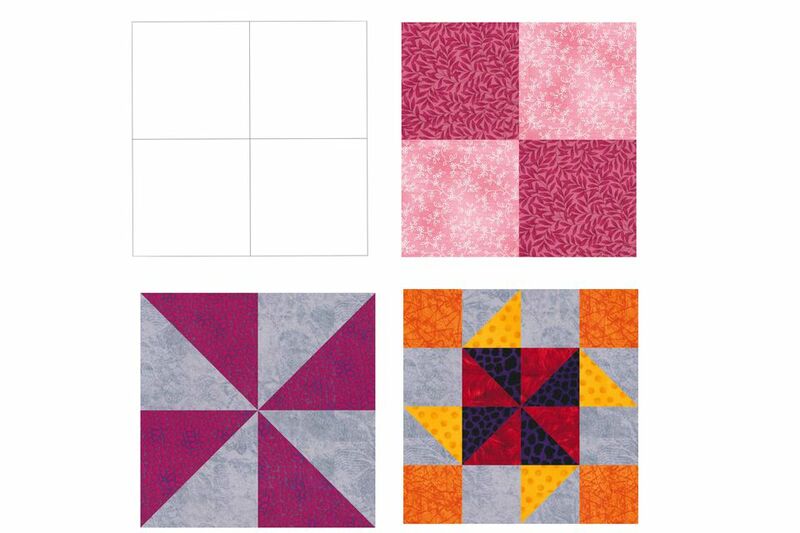 The most basic four-patch quilt block is made up of four squares arranged to make two rows — just like the blocks shown at the top of the illustration on this page. We use simple four-patches very often, but it's just as common to see four-patch blocks subdivided into more grids. The initial four patches are still obvious, but the grids have been divided to make a block more intricate. The pinwheel quilt block, lower left, illustrates a simple way to subdivide a four patch block, while the block on the right divides the grids into even more sections. Take a look at some of the patterns below to see if you recognize their original grid. Nine-patch quilt blocks initially contain nine equal squares. The squares are arranged three rows across and three down, like the simple nine-patch quilt blocks in the upper row of the illustration. Below the simple blocks are nine-patch blocks that have been subdivided into more grids — a more common layout for this popular quilt block. Lower left if a Double Nine-Patch, a design with endless appearance possibilities. On the right is a block that's been known by a few names, Split Nine Patch and Nine Patch Straight Furrows. Take a look at both patterns to learn two different assembly methods for the block. Five patch quilt blocks have 25 grids, five across and five down. Individual grids in five patch quilt blocks aren't divided quite as often as the grids in four-patch and nine-patch quilt blocks. The basket quilt block on the right is one example of a five-patch block that's been subdivided. Seven-patch quilt blocks are made up 49 grids, seven across and seven down. The individual grids in seven patch quilt block grids are often combined to create a larger patchwork, although some grids are divided into fairly simple patchwork, such as the Bear's Paw Quilt Block on the right side of the illustration. One patch quilts are constructed with a single, repeating shape. Thousand Pyramids, shown on the right, is one example. Grandmother's Flower Garden, shown on the left, is another. Tumbling Blocks is another example of a one patch quilt. Patches must sometimes be cut from partial segments of the single shape to fill in gaps around the edges of a one patch quilt. Doing that doesn't remove a quilt's one patch designation. One patch quilt patterns are often used to make Charm quilts, where no fabric is repeated in the design. Recognizing the quilt block structure is important. 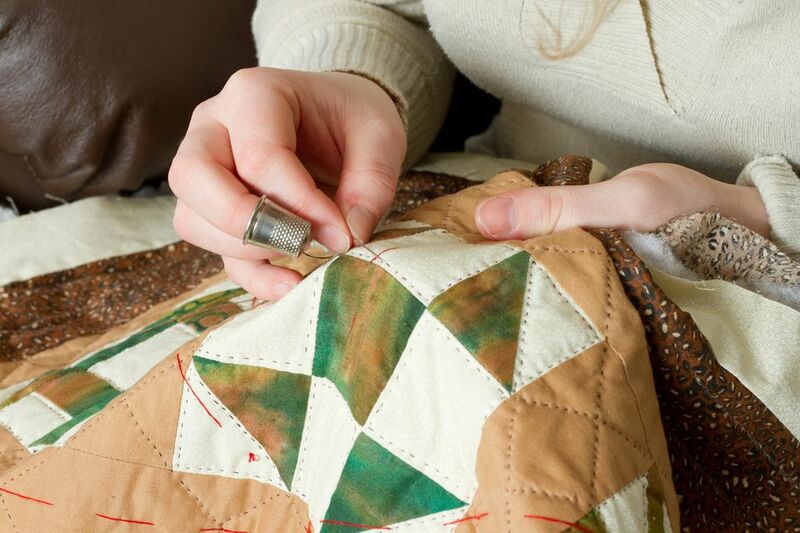 You might wonder, "why should I care about the patchwork quilt block structure?" The knowledge helps you design a quilt with blocks that flow together. The example on this page offers an illustration of four blocks with completely different layouts sewn side-by-side. Notice that the patches don't match up very well because of the differing grids, giving the combo an uneven appearance along intersections. If that isn't the look you want, choose blocks with similar grids or use sashing between blocks to camouflage their differences. Analyzing quilt block construction helps you choose a block size. To rotary cut, the fabric, choose a size with units you can accurately measure and cut with rotary rulers. You would probably need to construct templates to sew the blocks in the group above in the same sizes.